My thirteen year old daughter found this to be quite a magical project to put together (she was fairly surprised the first time she turned the triangles into a star. You can use these to decorate wreaths, hang in a row to make a chain or hang a bunch from a paper towel roll wrapped in blue construction paper to make a mobile. a bit of glue or tape. Take a piece of plain white paper and fold it in half. Cut the corner off the paper so that when you unfold the paper you get two equilateral (ish) triangles. 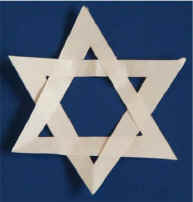 Slide the two triangles together to make a six pointed star. Add a bit of glue or tape so your star holds together.